The 1980s were marked by an increasing diversity of concerns and forms. A distinct separation had occurred between film and video makers, and television broadcast appeared as a viable medium for artists with the advent of Channel Four. Against the background of Thatchers conservative policies, clause 28, the Toxteth riots and the spectre of AIDS; issues of identity became a significant concern for artists, which lead to the formation of organisations such as Sankofa and Black Audio Film Collective. Written and researched by Tom Roberts. The first National Festival of Independent Video at South Hill Park Arts Centre, Bracknell, which continues until 1988. Independent Video magazine first Published (later Independent Media ) at South Hill Park Arts Centre, Bracknell. Sankofa and Black Audio Film Collective founded. Video Art: a History, Museum of Modern Art, New York. Network 21, pirate TV station transmits from South London. Channel 6, LVA/ICA,London/Bracknell Video Festival/London Filmakers Corp. Ghosts in the Machine, Channel 4 TV. 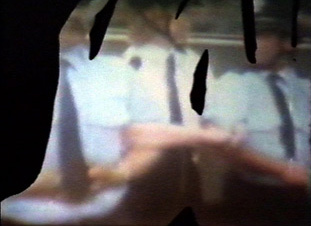 Second series of the video art showcase produced by John Wyver. Vis a Vis Festival, Camden Arts Centre/The Diorama, London. The Artists in Spectacolour, Piccadilly, London.